Queen of the House of Boys: Scramble to get ready for unexpected guests!!! Scramble to get ready for unexpected guests!!! Anybody ever scrambled at the last minute to get ready for house guests??? Stuffed things where they don't belong just to get them out of sight. Bit your tongue while people commented on how "nice", how "clean" your house looks...when inside you are thinking....PLEASE, for the love of all that is good...do not open my bedroom door....or all my junk may come tumbling out!!! I got an email yesterday that requested to give a rundown of who I am...and share with others that I will be soon be meeting from the blog world. My first thought was...what if they think my blog is stupid! What if they laugh at the complete generic look of my blog! What if, what if, what if..... And how do I sum up who I am in a short little story??? It is almost like giving my testimony. I have sat down to right out my testimony several times, but it just seems to go on and on and on. (kinda like this introduction)... Then I remembered, I LOVE my blog because: It is a part of my effort to be who I am...not what I think others need me to be, or to be liked for being someone I am not. I am NOT perfect, or anywhere close. I am a SAHM (Stay at home Mom), but that doesn't mean I am the world's best housekeeper etc. I am trying, one day at a time to clean out the "closets" of my life and just put out on the table what/who I really am. I have lived a long time trying to be someone else. So...without further rambling...here is my story may short.... This is me, Janelle, wife to James, mother to two sons. Queen of the house of boys. Thirty years old. In love with Jesus. Love to sing, especially on the church praise band. Love to try and be crafty. Love when my house is clean, but not good at keeping it that way. Good at blocking laundry out of my mind, but feel great about myself when I can keep up with it. I am a little addicted to TV, slightly addicted to blogs, twitter, facebook, and my email. God is working with me on these things. Yes...my picture is a headshot...why not the rest of my body you say??? Well, because I am overweight. To be exact, I am about 100 pounds overweight...and this is not one of those pleas to tell me "oh your not that bad", this is the honest truth. I don't like full body shots right now...so for now...this is my favorite recent photo. Except that now my hair is darker and the big mole on my nose has been removed!!! How did I get to be all the things listed above??? Well here is the more detailed version. My name is Janelle Miller. I live in central Iowa with my husband and 2 sons. 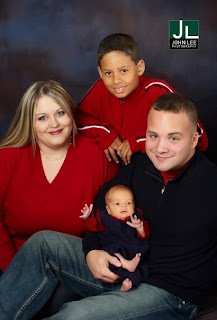 My husband is James, he runs our cleaning and restoration business while I am a SAHM. Our son Xavier is 11 years old and in the 5th grade. I had him when I was 19. I am a PK...aka...Preacher's kid. I went rebellious in my late teens. I went off to college and got out of the house for the first time only to return home a few months later...pregnant. Xavier's biological dad has not ever been an active part of his life and hasn't seen him since he was 3 years old. Xavier is bi-racial (Black/White). You might think this is unecessary information, but we have had quite the rollercoaster int he raising of Xavier and this plays a big part. His emotions are that of a puberty stricken teenager. He is athletic, smart and a good kid! Would be considered "strong-willed" child. I was a single parent with him for his first 5 years. Many struggles in that time. Many attempts by different things and people to fill the void where I had pushed God out of my life. In February of 2004, after an amazing set up by God, (this is a whole story in itself), I ran into and shortly thereafter began dating James, who was an old crush from my junior high days. Four months later we were married. During this period of my life is when my relationship with God was rekindled and my dedication to him was recommitted! 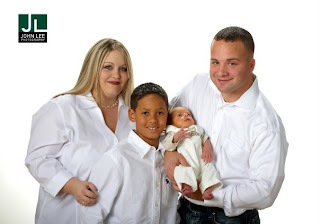 Within a few months of our marriage my husband was able to legally adopt Xavier as his own son. My hubs and I were anxious to have more children, and really thoguht I would be pregnant by the end of our honeymoon. God had other plans though and 4-1/2 years later, 4-1/2 LONG, ANTICIPATED, HEART BREAKING, EVER HOPEFUL, TRIALING, TRIBULATING, COUNSELING...years....I gave birth to our second son, River. He was born 5 weeks early on October 22nd after a bout with pre-eclampsia. He was born happy and healthy and in no need of NICU or any extra help. We spent 13 days in the hospital total, 8 before birth and 5 after. During those 13 days I signed up for Facebook, which got me connected with many old friends. Two friends of which are bloggers. Danielle, college room-mate (http://www.ourownlittlenest.blogspot.com/), and Angela, cousin from Oklahoma (http://www.angeleyesadventures.blogspot.com/) Through their blogs I found Mckmama-being that my baby is only a few days older then Stellan...I was hooked. A few months later I started this blog. Still baby new to me and very rough draft edition. But I am enjoying it and getting more and more into it. Good job Janelle! I didn't know that you and James only dated 4 months before you got married. Talk about a whirlwind! :) It was great seeing you and River last weekend! Janelle, you are beautiful and so is your blog! I can't wait to meet you next week! (by chance have I already? Were you at the brunch? You look so familiar!!! I cannot find my list to verify...). I think I've given up on the last minute pick ups mainly because I've seen so many homes worse than mine; HOWEVER, this doesn't mean I don't have my moments of shame and embarrassment at why I didn't do the last minute pick up!! Don't ya just hate that! I can't believe you are going! I am so jealous wait it sounds better to say green with envy! ha! Have a great time! When did you get the mole removed? I totally forgot about the mole until you pointed it out goofy. Still waiting on dark hair pics too! Great intro for your new bloggy friends! Remember me when you get big! Love you!